Monsanto Company (MON) is The Enemy – the embodiment of everything wrong with Big Food. It’s the major force behind genetically modified organism (GMO) seeds, or engineered “Frankenfood.” And that stuff boosts corporate control of our food, doesn’t actually lead to improved yields, increases use of chemicals in farming, contaminates neighboring “organic” farms, and is rooted in biased research. It’s also to blame for our obesity epidemic, and its products have been linked by researchers to cancer. According to a 2009 paper published by the International Journal of Biological Sciences,GMOs increased body weight in rats. Another paper — later retracted by the journal that published it but republished by another after corrections — detailed research that revealed an increased rate of cancer in rats that were fed on Roundup-treated genetically modified corn. 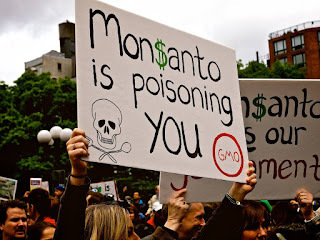 And let’s not forget that Monsanto, which was founded in 1901, was among the group of companies that produced Agent Orange and its main poison, dioxin. It also sold DDT, PCBs, the controversial dairy cow hormone rBGH, and the cancer-linked aspartame sweetener. It’s no longer a chemicals-and-plastics company, although, ironically, that’s not even how it earned its bad reputation. Beginning in the 1980s, Monsanto shed those assets and began acquiring seed companies, investing in biogenetic research and recasting itself as an agriculture company. And then, in the aftermath of the 1996 mad cow outbreak in the United Kingdom, Monsanto tried to market its patented glyphosate-resistant “Roundup Ready” soybean seeds in Europe. Those seeds had been approved the U.S. Department of Agriculture in 1994. And the European Union OK’d them, too. Monsanto’s push-back campaign was a miserable failure, dismissed as insincere by consumers. Its attempt to acquire a company that pioneered “terminator seed” technology – second-generation seeds are sterile, thus limiting the spread of genetically modified plants to other farms – only worsened the situation, as farmers would be forced to buy new seed every year. It hasn’t gotten any better for Monsanto. Environmental groups continue to play on what the public doesn’t know, plucking the emotional strings of “personal health” and “safety” with great effect. But what if we have it wrong about big, bad Monsanto and the whole concept of engineered food? Next, Sir, I think you may have an exaggerated idea of the naturalness of “traditional” or “organic” agriculture. Agriculture has always been unnatural. Our species began to depart from our natural hunter-gatherer lifestyle as recently as 10,000 years ago – too short to measure on the evolutionary timescale. It’s easy to blame Monsanto for a lot of things. But obesity actually boils down to the overall diet and physical activity, at least according to the Food & Brand Lab at Cornell University. Alas, we all love a bogeyman. And science is hard. So let’s just work on the assumption that Monsanto is evil. Can it rehabilitate itself and become a force for good? Take, for example, Monsanto’s $930 million all-cash acquisition of Climate Corp. in October 2013. Of course, Climate Corp.’s founders – a couple of former Google employees – had to defend themselves against a serious backlash. But that billion-dollar investment by Monsanto is going to help Climate Corp. scale up so much that small farms and the farmers’ markets where their products are sold will be able to maximize efficiencies. They’ll be able to take advantage of detailed weather prediction, monitoring, and analysis services. And it will involve zero engineering of any food at all. Climate Corp. was the first major cash-out by an “Internet of Food” startup. But funding continues to flow into the space. A problem like our messed-up food system is a given for the information aggregating and dispersing capabilities of the internet. And we’re just getting started. This is where the application of information technology will help solve a real need rather than simply lead to another “must-want” product. Cheap and abundant food is important. Climate Corp. will help us satisfy that need.